Details for Marella Spirit can be found below. 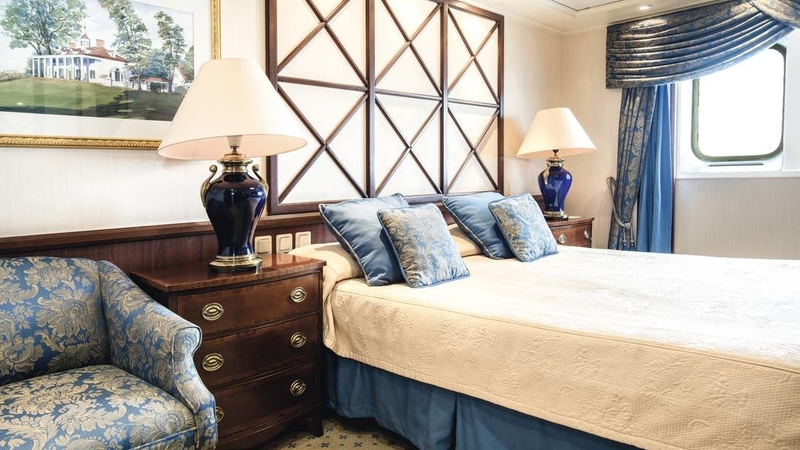 Marella Spirit is the longest-serving member of our fleet and is as popular now as it’s ever been. Part of the appeal is that it’s one of our smaller ships, so it’s got a great homely feel about it. The crew will treat you like one of the family from the moment you step on board. The portfolio here is pure gold – think fine dining, the fantastic Oceans Gym with ocean views, and entertainment that includes everything from Broadway-style shows to live cabaret and a full daytime activity programme. 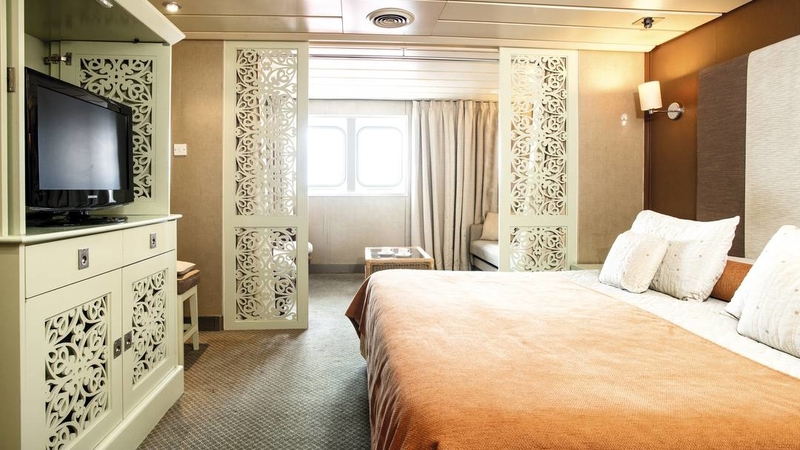 Set on decks 6-8, our deluxe cabins come with queen-size or twin beds. A folding bed sleeps a third person. A picture window keeps the 19m² space light and bright, and it’s furnished with chairs and a table, plus a minibar. The en suite bathroom has a shower over a bath and a WC. Some of the cabins are inter-connecting. Call 0203 636 1862 for details. Calls cost 10p per minute, plus network extras. The view from some deluxe cabins may be partially obstructed by lifeboats. Reserve your cabin for a clear view. 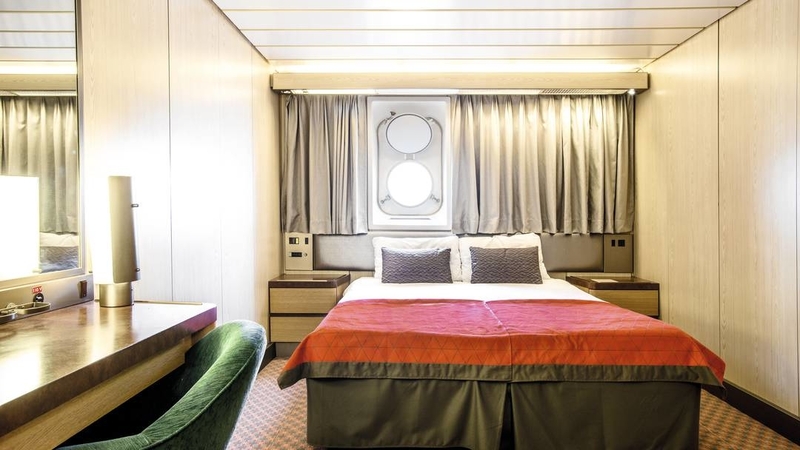 You’ll get a queen-size or twin beds when you pick a deluxe balcony cabin, which measures 19m². For your comfort, the rooms are equipped with chairs and a table, plus a minibar. Best of all, they have a private furnished balcony for sea views. The en suite bathroom has a shower over a bath and a WC. Standard inside cabin sizes are 13-16m². Your space is accessorised with pale furnishings and fabrics, and there’s a queen-size bed or 2 singles side by side or in a L-shape. 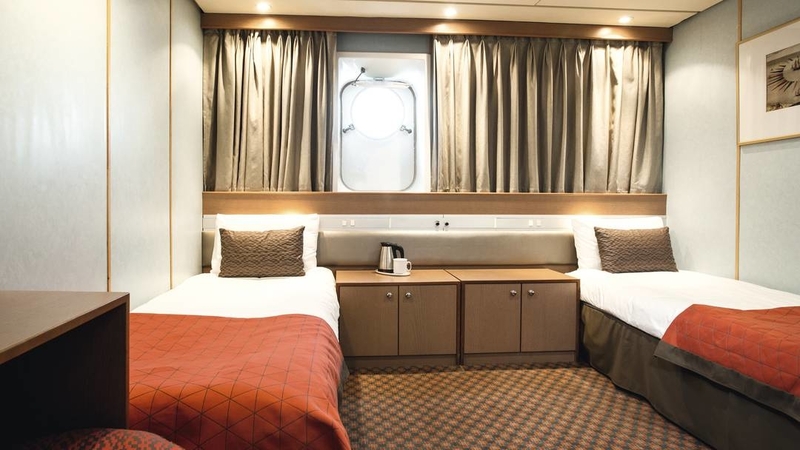 The 4-berth cabins have twin beds and 2 upper berths that fold down, plus extra wardrobe space. The en suite bathroom has a shower and WC. Outside cabins have a porthole so you get the benefit of sea views. There’s a queen-size bed or 2 single beds, side by side or in an L-shape. For families, our 4-berth cabins have twin beds and 2 upper berths that fold down when they’re needed. There’s extra wardrobe space here, too. 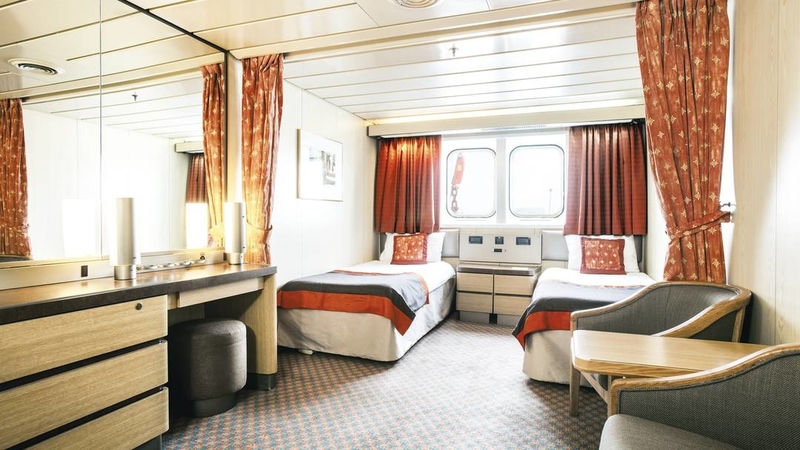 Standard cabin sizes are 13-16m², and there’s an en suite bathroom with a shower and WC. 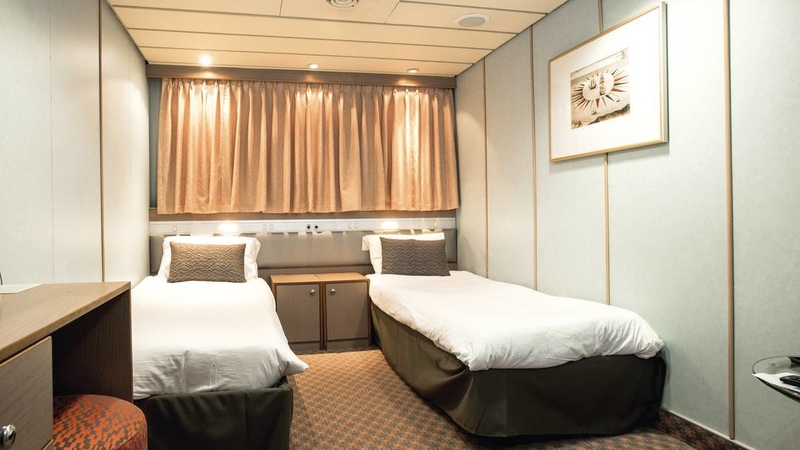 Outside cabins have 2 twin beds, an en suite wet room, and a porthole. 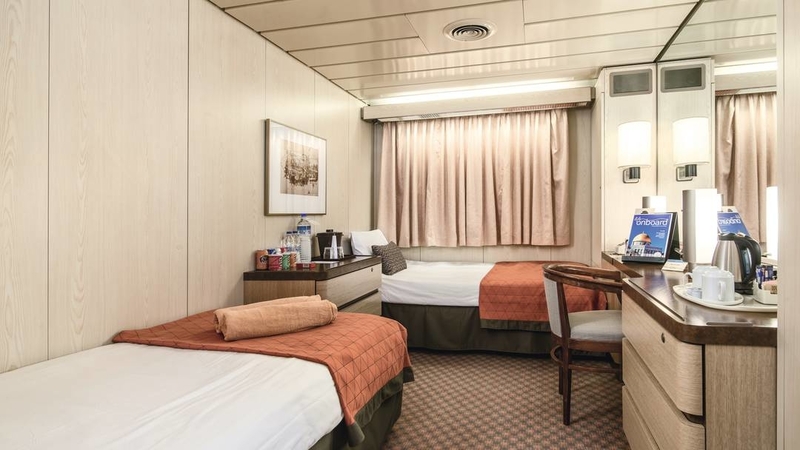 Our 4-berth cabins have twin beds and 2 upper berths that fold down when they’re needed for families. Cabins are 13-16m². These compact yet comfortable cabins are designed with the single traveller in mind. They come with a porthole for sea views, a single bed and an en suite bathroom with a shower and WC. They’re often booked by solo cruisers or friends who prefer not to share when travelling. All suites have king-size beds and a separate lounge area with a sofa-bed, a table and comfortable chairs. A picture window lets light in to these 26-27m² rooms. They’re neutrally dressed with calm colours and wooden furnishings. The en suite bathroom has a shower over a bath and a WC. A minibar and bathrobes are nice-to-have extras. write a review of Marella Spirit.